We recently had solar panels installed on our home by Real Goods Solar in March of this year. You can actually see that on current satellite photos, all you need is to make use of possible satellites overhead for photos. This post describes some of the process and analysis that went into the decision, the installation and tracking the results. We are a pretty green family and try to minimize our impact on the environment. Chris has been very interested in energy use and the environment for a long time (including majoring in this subject in college and grad school and is currently working in the field). 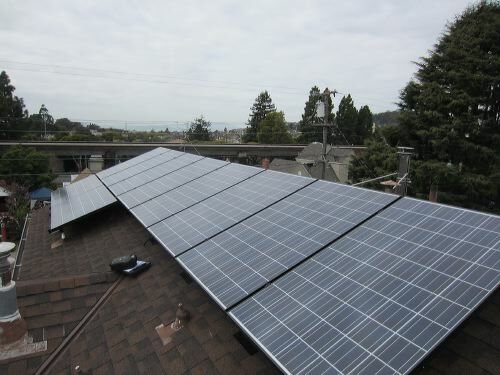 Solar electricity produces no air pollutants or greenhouse gas emissions during operation (there is some energy and pollution generated when the panels are made, but that is typically offset in a year or two). It also produces electricity during times when demand is highest which helps to alleviate stress on the electric grid. Peak electricity use in California occurs in summer afternoons, when air conditioning use is highest. And such high amounts of power usages do not in the slightest help in mitigating global warming. It is down to us to have a sense of responsibility and protect our home, and grab any opportunity to protect the planet. We can easily start with small measures right from our homes, like we could compare gas and electric usage and try to minimise them as much as possible. Since we don’t have air conditioning, the excess electricity that we generate during these hours helps to reduce demand during peak hours (which offsets electricity use from inefficient and polluting peaking power plants) and reduces strain on the transmission and distribution system.